Serena Williams and Maria Sharapova overcame furnace conditions in contrasting style to set up an Australian Open semi-final showdown as soaring temperatures forced play indoors here today. While refusing to say anything on the security aspect, the two-member venue assessment team from Pakistan lavished praise on the PCA stadium at Mohali today. Premier batsman Sachin Tendulkar had enough time to be fit for the upcoming series against Pakistan beginning in February last week, BCCI Secretary S.K. Nair said today. England sealed their first Test series victory in South Africa for 40 years when the fifth match ended in a draw today. It has been a long wait for Gurbachan Singh Randhawa to get the coveted Padma Shri Award. His name was shortlisted twice in the past, but got eliminated at the last round. Western Union Financial Services Inc. will sponsor the two Premier Hockey League (PHL) teams from Punjab — Sher-e-Jallandhar and Chandigarh Dynamos — for three years. It will also launch a national-level marketing campaign to promote the two teams. This was announced at a press conference here today. Mohun Bagan laboured to their first victory in the ninth National Football League when they overcame stiff opposition from Sporting Clube de Goa 1-0 at the Salt Lake stadium here today. A second-half goal by Baldeep Singh enabled JCT Mills, Phagwara get the better of debutants Fransa Pax Football Club, Goa by a 1-0 margin to register their first win and collect full points in the third round of the ONGC Cup 9th edition National Football league match here at Nehru Stadium, Fatorda today. JCT Phagwara, won the 43rd Principal Harbhajan Singh Memorial Football Tournament and BSF, Jalandhar, were runners-up at Mahilpur today. The teams were 1-1 after full time. The home matches of JCT Phagwara in the ongoing ninth National Football League will be played at Ludhiana. According to Arjuna awardee Inder Singh, secretary of the Punjab Football Association, JCT will meet Goa's Salgaocar SC at Ludhiana's Guru Nanak Stadium on January 29 . Florida-based former world number one Williams hardly broke sweat to overwhelm French second seed Amelie Mauresmo 6-2, 6-2 on a sun-baked Rod Laver Arena centre court sealing an impressive victory with an ace. But the fourth seed Sharapova found the sweltering conditions much harder to deal with before prevailing 4-6, 6-2, 6-2 against compatriot Svetlana Kuznetsova. Sharapova’s match was halted for 10 minutes after the second set as the sun beat down on Melbourne Park. Tournament officials later suspended play as the temperature passed 35°C. Wimbledon champion Sharapova said she had struggled to cope with the heat. “I need a wheelchair right now” she said after completing an energy-sapping victory in 2hr 17min. The 17-year-old starlet admitted she had been struggling from the outset. “I was just trying to tell myself mentally just to get through it,” she said. “I kept thinking back in my off-season, you know, how hard it was when I was training physically, and I thought I couldn’t go any more, but I knew that I had some more even though my body thought I didn’t. Kuznetsova admitted the temperatures had made conditions hard but she put the defeat down to a mental collapse that saw her game fall to pieces in the second and third sets. “I was very focused and I played very well first set. And after that something happened, so I just stopped. I mean, I just stopped playing. My body was there, but my mind wasn’t there at all. I didn’t deserve to win because I just didn’t fight. I mean, if I want to be No.1, if I want to go more forward, if I want to win more Grand Slams, I just have to change totally. But while Sharapova and Kuznetsova looked drained after their tie, seventh-seed Williams — the 2003 champion — appeared fresher than ever after romping past Mauresmo in 1hr 11min. 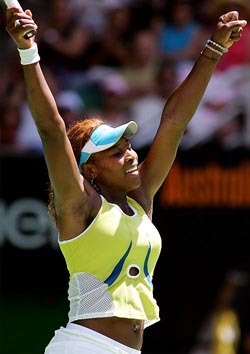 “I feel great,” said Williams, used to playing and training in the heat and humidity of Florida. “I played a really solid match. I’m used to making about 40 errors but today I made a lot less. David Nalbandian won a late-night battle with fellow Argentine Guillermo Coria 5-7, 7-5, 6-3, 6-0 to reach the quarter-finals of the Australian Open for the third successive year. 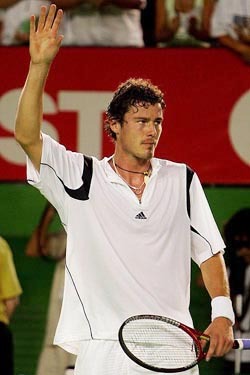 He set up a clash with third seed Lleyton Hewitt, a repeat of the 2002 Wimbledon final, which was won by the Australian. Swiss world number one Roger Federer underscored his status as tournament favourite and current king of tennis by clinically dispatching four-time champion Andre Agassi in straight sets, winning 6-3, 6-4, 6-4. It was a consummate display from the 23-year-old Federer, bidding to become the first player to win three consecutive Grand Slams since American Pete Sampras in 1993-94. “I wanted to get away to a good start in the match. I really served well for the whole match and he never broke me,” said Federer, who fired 22 aces against just one from Agassi. Federer’s virtuoso performance enabled him to equal Agassi’s stretch of 26 unbeaten matches set back in 1995 — the joint third-longest winning streak since 1990, behind Austrian Thomas Muster’s 35 in 1995. 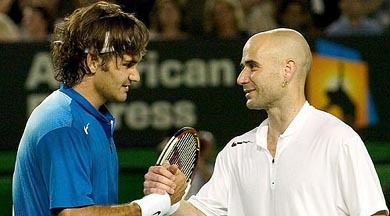 Agassi, at 34, the oldest man in the field, was gracious in defeat. “He just outplayed me. He was too good,” said the evergreen eight-time Grand Slam winner. Federer would now play Russian fourth seed Marat Safin in the semifinals on Thursday, the man he beat to lift last year’s men’s singles crown. Safin reached the last four earlier after benefiting from a decision to play his quarterfinal against Slovakia’s Dominik Hrbaty with the roof closed on the Rod Laver Arena as temperatures soared. Tournament organisers ordered the match be played under cover as the mercury shot past 35°C and Safin took full advantage of the cooler climate to rout Hrbaty 6-2, 6-4, 6-2. While refusing to say anything on the security aspect, the two-member venue assessment team from Pakistan lavished praise on the PCA stadium at Mohali today. "It is too early to comment. We have just reached here and seen the facilities. We are not in a position to say anything as yet," Sohail Khan, security in charge and SSP Lahore, stated, while addressing newsmen. Sohail, along with Zakir Khan, General Manager, Cricket Operations, Pakistan Cricket Board, reached the PCA this afternoon and went around the stadium visiting various facilities. "We will hold a meeting with the officials concerned here and discuss the matter. It will be premature to comment at this stage," was his categorical reply to queries from the newsmen. After having a look at the lush green Mohali wicket, players' dressing rooms, the practice area and the multi-gymnasium, they settled down to answer queries. "It is all hearsay. It is press-generated basically," Sohail retorted when asked about reports appearing in a section of the media regarding the reservations about Ahmedabad as a Test venue. "We will discuss the matter with the administrators there. Then there will be talks between the boards of the two countries. Any decision would be taken only after that," he quipped. Sohail Khan made it evident that they were in India "not to direct the security operations". "They (Indian security officials) are all capable people and will look into these details. We are here for coordination only," he said. "There is need to have proper liaison between India and Pakistan to have better understanding of the issue. There should not be any problem in this regard," he stressed. While appreciating the infrastructure at the PCA, Zakir Khan, former Pakistan player, said it was of the "highest quality". About the security issue, his reply was terse, "We are not in a position to comment." Sending venue inspection teams to the visiting country had become a part of the overall programme of the cricket teams these days, Zakir observed, declining to say anything about Ahmedabad. About the cricket fans likely to visit India during the tour beginning next month, Zakir said it was difficult to predict the exact number, though enthusiasm among the people in Pakistan about the forthcoming series was great. Mr M P Pandove, secretary of the PCA, said nearly 5,000 fans from across the border visited the country last time. "If the response is similar this time, we will allot them a separate block. We were looked after very well when we were in Pakistan during the recent series. We are too keen to reciprocate the gesture," he said. 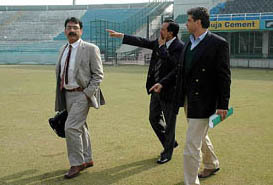 As for the mass hysteria and interest the cricket series between the two cricket arch rivals was likely to generate, Mr G S Walia, PCA treasurer, revealed that certain traders and shopkeepers had approached the PCA and expressed their desire to offer special discount on any item to the guests from Pakistan during their stay in the country. The team was scheduled to leave for Kolkata in the afternoon, where they would hold talks with the Indian cricket board officials and inspect eastern venues. The Pakistan team, which will arrive in the country in February-end, is slated to play three Tests and five one-day matches. England, set a target of 185 in 44 overs, recovered from 20 for three to reach 73 for four when bad light ended play 16 balls early. Vaughan was unbeaten on 26 at the end, with all-rounder Andrew Flintoff on 14. Earlier, A.B. de Villiers scored 109 and Kallis an undefeated 136 in South Africa’s second innings of 296 for six declared. Kallis batted for 277 minutes, faced 217 balls and hit 16 fours and a six, becoming the 25th player to score 20 Test centuries. The declaration came after Mark Boucher tried to force a delivery from fast bowler Hoggard through the on-side and was caught by Trescothick at mid-wicket for six. Fall of wickets: 1-17, 2-29, 3-256, 4-267, 5-277, 6-296. It has been a long wait for Gurbachan Singh Randhawa to get the coveted Padma Shri Award. His name was shortlisted twice in the past, but got eliminated at the last round. But this time around, he was lucky and promptly thanked Indian Olympic Association president Suresh Kalmadi for getting him the award. “It’s better late than never” was the reaction of Randhawa. Randhawa, who was the first Arjuna Awardee when he was bestowed the honour when the award was instituted in 1961, rose to international fame when he won the 110m hurdles gold in the 1962 Jakarta Asian Games. He missed an Olympic medal by a whisker when he finished fifth in the hurdles at the 1964 Tokyo Olympics. He had also participated in the 1960 Rome Olympics. The other Padma Shri Award winners include cricketer Anil Kumble, shooter Rajyavardhan Singh Rathore, former All-England badminton champion Pullella Gopichand and sky jumper Rakhael Thomas. For Olympian shooter Rathore, the Padma Shri Award has come as an ample compensation for not getting the Rajiv Khel Ratna Award last year, despite winning the silver medal in the double trap shooting event at the Athens Olympic Games (The Khel Ratna Award was given to Anju Bobby George). Rathore was the first Indian to win an Olympic silver medal in an individual event and only the fourth Indian to win an individual medal, the others being K.D. Jhadav in wrestling (bronze), Leander Paes in tennis (bronze at Atlanta) and Karnam Malleswari in weightlifting (Sydney). Anil Kumble is known as a gentleman cricketer with a knockout punch. The batsmen all over the world will vouch for his penetrative and killer deliveries. No wonder, within 14 years after making his Test debut against England at Manchester in 1990 at the age of 19, he surpassed Kapil Dev’s world record wicket-haul of 434. He equalled Kapil’s record against South Africa at Kanpur in December last year and surpassed the record in the first Test against Bangladesh at Dhaka when he trapped Mohammad Rafiq lbw for 47. Kumble received the Arjuna Award in 1995. Born on October 17, 1970 in Bangalore, the right-arm leg-spinner became the second player, after England’s Jim Laker, to take all 10 wickets in a Test innings against Pakistan in New Delhi in 1999. Sidelined for more than a year following a shoulder injury in 2000, he roared back into Test cricket with a 8 for 133 haul, including 6 for 81 in the second innings against England at Mohali. And in January 2004, he claimed eight for 141 against Australia at Sydney, which was the best by any bowler against Australia since Tom Richardson’s 8 for 94 for England in 1898. He made his one-day international debut against Sri Lanka at Sharjah in April 1990. Pullela Gopichand, the nice-guy shuttler from Hyderabad, kept the glorious legacy of Prakash Padukone when he won the All-England Championship title in 2001 to attain his career-best world ranking of 5. Born on 16 November, 1973 in Nagaland to a Bengali father (Pullela Subhash Chandra Bose) and a Telugu mother (Subbaravamma), Gopichand, who participated in the 2000 Sydney Olympics, came up the ladder the hard way, battling a series of injury-induced lay-offs on the way, the worst being the multiple ligament rupture he suffered in 1986. 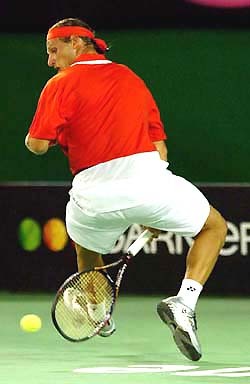 He won his first national singles title in 1989 at Goa and since then has made the national championship his fiefdom. In 1999, Gopichand’s ranking rose to 26 after he won the Indian national championship title, as well as major wins in the Scottish, Toulouse and French championships. He received the Arjuna Award in 2000. The soft-spoken Gopichand, who has refused to feature in liquor and cola ads, despite getting lucrative offers, is the follower of the ‘Art of Living Guru’ Sri Sri Ravishankar. Gagan Ajit Singh, captain of the Sher-e-Jallandhar team, who was also present, said PHL matches had all the pressures of an international match. All teams in tier I were balanced, he said, adding that his team would do their best to win the inaugural trophy. He said the PHL had provided the players with a platform to showcase their talent and skills, adding that sponsorship was an added encouragement. Asked why PHL matches were being held only in Hyderabad, Himanshu Verma of ESPN said Gachibowli stadium was the only stadium in the country to have floodlights. He said floodlights were being installed at hockey stadiums at Chennai and Chandigarh and then these two cities could also host PHL matches. Sher-e-Jallandhar are currently leading in tier I with eight points. In tier II, Chandigarh Dynamos, who have won all their matches, are leading with 15 points. Irina Brar is back with the lady’s golf crown on her head. Yes she clinched the 88th All-India Ladies Amateur Golf title in Kolkata to emerge the undisputed queen of the course. She won six of the all-India tournaments in the women’s golf circuit. This was a great achievement for this golf icon of Chandigarh who has been suffering from a nagging lower back pain for the past two years. In fact it was a great comeback for 21-year-old Irina. She had last won the national circuit championship two years back. But what appeared good for Indian ladies’ golf is the emergence of two young golfers. Fourteen-year-old Vaishavi Sinha of Noida who matched Irina stroke for stroke in the play-off at Kolkata till the 33rd hole. But that was as far as Irina allowed her to go. She won on the 34th hole. Third in this tournament was 13-year-old Sharmila Nicollete. The BA final-year student of MCM DAV College tallied 120 points from the circuit tournaments to clinch the lady golfer of the year title. 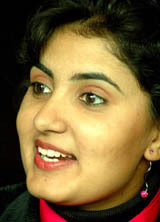 Second placed was Parnita Garewal, who has become the first Chandigarh girl to turn professional. Following them was Vaishavi Sinha. Now it will be study time for Irina. But that will be after a one-week break. During the Kolkata tournament her lower back pain extended to her legs. She consulted a physiotherapist in Kolkata, but got little relief. She is now looking forward to the Queen Sirikit Cup to be held in Bangkok in May. Her sponsors Indian Oil have stood by her throughout. Both teams were now on four points from three matches. Mohun Bagan shot into the lead six minutes into the match, when Beto converted a penalty. Beto sent a through pass to Jerry Zirsingha, who cut in sharply inside the box, where he was tripped by Felip Gomes. Referee P. Bhaskar immediately pointed at the spot, from where Beto converted. The match went into extra time and then tie-breaker was applied. JCT converted four spot kicks while BSF could convert only three. In college category, SGGS Khalsa College, Mahilpur, defeated Khalsa College, Jalandhar, 2-0 to win the tournament. On February 2, JCT will play Goa's Vasco SC while the match against another Gon outfit, Churchill Brothers, is slated for February 20. The Phagwara outfit will then face Kolkata's Tollygunge Agragami on February 23 and State Bank of Travancore on February 28. All the matches will begin at 2 pm.